The German Telekom plans the introduction of LTE-Advanced (category 6) at speeds of up to 300 Mbit/s from the summer of 2014. This information was announced at CeBIT, held in Hannover since Monday. The increased bandwidth would be realized mainly in cities and in places with high traffic. Technically, it is LTE Category 6, Telekom combined the frequency bands around 1800 MHz and 2600 MHz (carrier aggregation). The German Telekom has its LTE network currently being expanded to three frequency ranges. In the country, LTE800 was used in the frequency range around 800 MHz, the Telekom stand for 10 MHz bandwidth. The maximum speed is here around 70 MBit/s in downlink, in reality about 50-55 Mbit/s can be achieved. On the other hand, in cities, small towns and larger villages expanded to LTE1800, here a 20 MHz wide spectrum is available, i.e. the maximum speed with LTE Category 4 is about 150 Mbit/s. The LTE1800 network is thus significantly more powerful than the LTE800 network. However, it also has a shorter range and this is even very useful in the city, then radio cells are not overloaded so big and so quickly. Telekom also uses the frequency range around 2600 MHz. LTE2600 is mainly developed in the places where many people gather, such as airports, train stations or city centers. For example, in the subway at the Nuremberg or main station in Friedrichshafen. Also on LTE2600 up to 150 MBit/s are currently achievable in downlink, because there is a 20 MHz wide range available. To achieve maximum downlink rate of 300 Mbit/s, two frequency bands of 1800 MHz and 2600 MHz, are combined and concentrated in the terminal to a 40 MHz wide channel. This is called carrier aggregation to German carrier bundling. Carrier aggregation is a part of LTE-Advanced and 300 Mbit/s is called LTE Category 6. Today’s devices can usually support only LTE Category 3 or Category 4, so for the new speeds in each case, new devices will be necessary to support the Carrier aggregation or Cat 6. 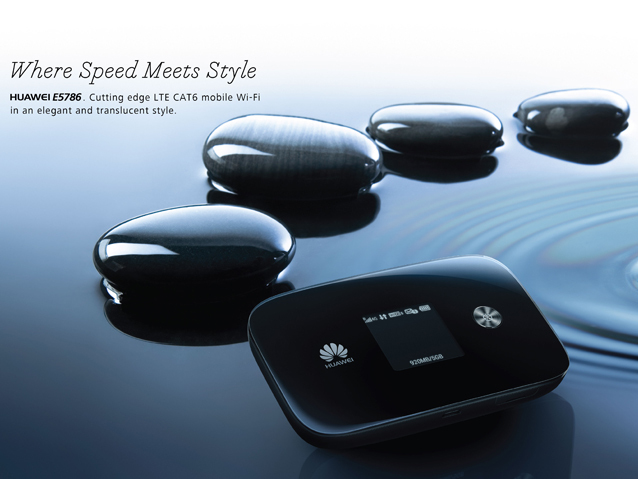 The Huawei E5786 is a first LTE mobile hotspot presented for Cat 6, we had introduced this hotspot here. The speed of 300 Mbit/s will be available according to Telekom from summer; exact details are not yet streamlined. But it is certain that the particular location must be supplied in any case simultaneously with LTE1800 and LTE2600. Of course, Carrier Aggregation with LTE1800 and LTE800 would be possible, here are then up to 225 Mbit/s can be achieved, provided that both bands can be received.